Dunkin' Donuts is giving away free iced coffee! WASHINGTON – What does a Washington Capitals win mean? Tired fans at work who need a coffee. And Dunkin' Donuts in DC has just what you need, for free. 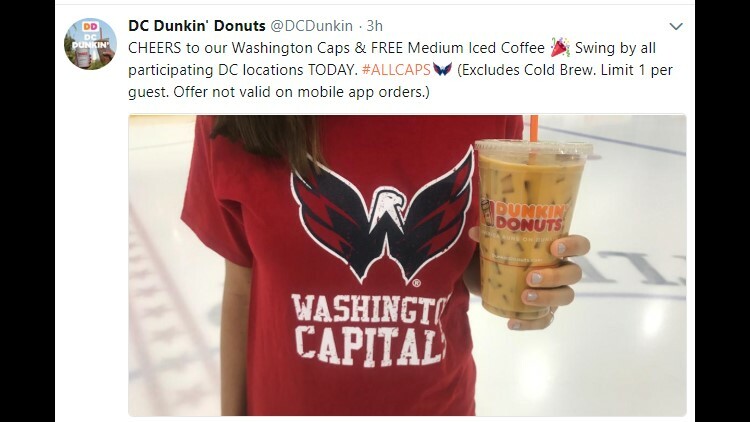 Dunkin’ Donuts is giving away free medium iced coffee again as part of their usual Caps Win, You Win campaign. If you want free coffee, head over to participating DC Dunkin’ Donuts locations Tuesday to get that much needed caffeine fix. Find your closest Dunkin here.